Copyright © 2017. Coconut Creek. All Rights Reserved. 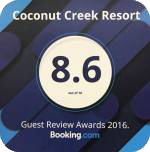 Coconut Creek: 19 and counting! Ganpati Bappa Morya, Ganesh Chaturthi is here! The pride of South Goa beach resorts is the epitome of true Goan hospitality with exemplary dining and award-winning service, that pampers you to the core at the best restaurants in South Goa.